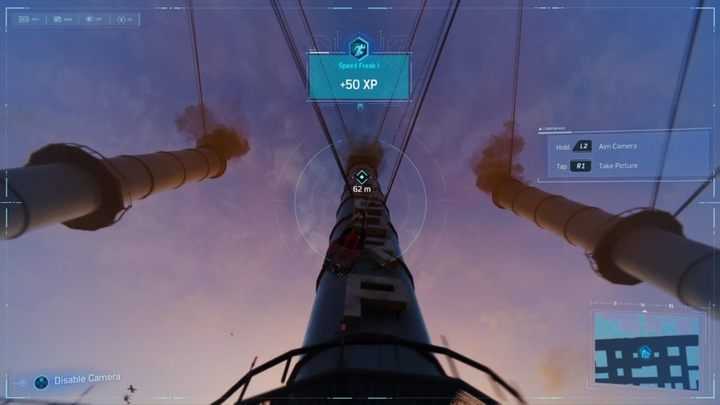 How to take photos in Marvel’s Spider-Man on PS4? How to get Crime Tokens in Marvel's Spider-Man on PS4? Peter Parker always was involved in photography; he worked as a reporter for Daily Bugle, for example. In Marvel's Spider-Man, the man no longer is a journalist, but he still carries his camera. Just press the up arrow and you will enter the photo mode. Peter Parker always was involved in photography; he worked as a reporter for Daily Bugle, for example. In Marvel’s Spider-Man, the man no longer is a journalist, but he still carries his camera. Just press the up arrow and you will enter the photo mode. Use the right analog stick to move the camera around. Hold L2 to zoom in and R1 to snap the photo. They’re quite a few moments in the game when you have to photograph an object. This is especially common in the missions played as MJ. Additionally, the game also contains the so-called Landmarks – photographing them yields Landmark Tokens, which can be used to craft new suits and gadgets. Copyright © 2014 - 2019 SocksCap64, All Rights Reserved. Logos, Trademarks, Pictures Belongs To Their Respected Owners. Powered By WordPress. 63 Queries in 0.369 seconds.